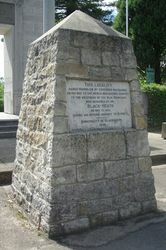 Cairn built in 1939 by the Kooya Committee of Historical Research in conjunction with the Blackheath Municipal Council commemorates the naming of Blackheath on May 15, 1815 by Governor Macquarie. Stones for the cairn were taken from Gardner's Inn (Blackheath's first inn) which was demolished in 1938. On Saturday at 3 p.m. a sandstone cairn with a marble tablet, erected by the Blackheath Municipal Council to commemorate the fact that Blackheath was named by Governor Macquarie in 1815, will be unveiled by Mr. W. L. Havard, honorary secretary of the Kooya Committee of Historical Research. 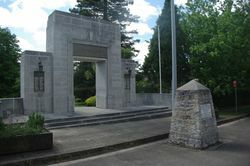 The cairn is situated on the Great Western Highway opposite the railway station, and directly in front of the soldiers' memorial arch. 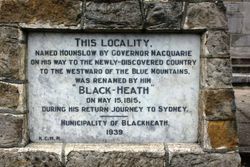 The inscription reads: "This locality named Hounslow by Governor Macquarie on his way to the newly-discovered country to the westward of the Blue Mountains, was renamed by him Blackheath on May 15, 1815, during his return journey to Sydney." The Sydney Morning Herald (NSW), 7 April 1939.
" BLACK - HEATH "
During His Return Journey To Sydney.